The impure enemy of mankind struggles mightily against a person who is susceptible to the passion of fornication, so that such a person might remain darkened by this passion and will not be able to look upon God. «For, only the pure in heart will see God. It was upon this field of battle that our holy father Moses fought and defeated the power of the impure enemy, giving us an example of such a victory. Saint Moses was a Hungarian by birth. Together with his brother George, he was in the service of the pious prince, Boris the Passion-bearer, who loved Moses very much. During the battle on the Yalta River, in the war between Prince Boris and Prince Svyatopolk, Saint Moses was the sole survivor of Boris’s forces. blessed Moses fled to Kiev, where he hid from Svyatopolk in the home of Predislava, Prince Yaroslav’s sister. Here, Moses spent his time in prayer. Finally, Prince Yaroslav defeated Svyatopolk, who then fled to Poland. Later, Svyatopolk returned with Boleslav of Poland and his army. They drove Prince Yaroslav away and occupied Kiev. King Boleslav returned to Poland taking as captives two of Yaroslav’s sisters, several boyars and St Moses. The blessed one, who was huge and muscular, and exceedingly handsome, was led away chained by his arms and legs. To the people she said, «This is your lord, and my husband.» Everyone bowed to Moses. In desperation, the woman wrote to King Boleslav, accusing Saint Moses and asking the king to influence him to accept her. The saint’s prophecy was truly fulfilled. The woman began to torture Moses all the more, ordering that he be given a hundred lashes each day, so that he would eventually die from bleeding. Meanwhile, King Boleslav raised a great persecution against the monks and drove them out of Poland. In the midst of all this, Boleslav fell ill and died suddenly one night. At his death, a great rebellion broke out in the land and the people rose up and slew their bishops and nobles, including this shameless woman. The slaves were freed. Saint Moses, the good warrior of Christ, had suffered for six years. For five years he had struggled in his chains, showing the patience of Job, but in the sixth year, he suffered courageously for purity more than Joseph. 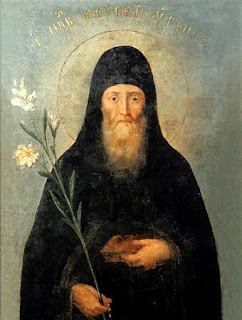 After his liberation, he made his way to the Kiev Caves, where he struggled as a hesychast for ten more years. Here, he radiated the grace of God and attained to great spiritual heights. He reposed on 26 July, while St Antony was still alive. His sacred relics repose uncovered and uncorrupted in the cave of St Antony. Through his holy prayers, many have been delivered from fornication and impure passions.